← Can we compromise with anti-gun activists? This entry was posted in pistol, weapon and tagged 1911, 380ACP, AllOutdoor. Bookmark the permalink. This could be a fun trainer for smaller persons and responsible teens. My son might like this one. Now that I’ve shot the 380, I plan on re-visiting the 22. Originally, I was put off by the reduced size sights, but it turned out they work just fine. 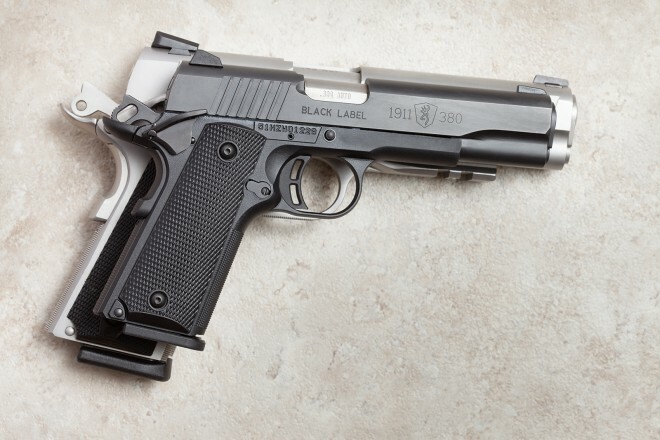 It probably solves the problems involved in reducing a full-size 1911 in caliber only to .380. It’s probably as reliable or more reliable to the older hidden hammer Browning design Pocket Colts. Now THAT is a nice little pistol most 1911 owners could learn to love, even if the ‘mouse gun’ round is involved. The earlier model Browning 1911-22 I handled was VERY cute and handy, but its trigger was overly heavy. Are the triggers on these newer Black Label models reliably better? I am seriously considering buying one, but at over $500 for a .22 pistol, the trigger and sights should Just Work. If it also came with the slide milled for some sort of decent, compact, low-mounted red dot reflex sight, I’d order one immediately. I wonder when they will be available!